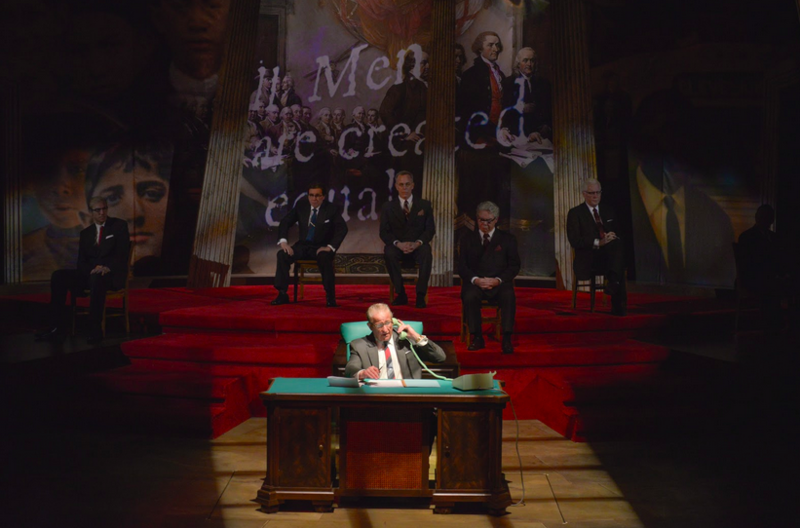 The Texas premiere of The Great Society, the second of Robert Schenkkan’s stirring LBJ plays exploring Texas’ own political mastermind and his memorable years in the White House, plays on stage in the Topfer Theatre January 25 – March 5, 2017. Directed by Dave Steakley, ZACH Theatre’s Producing Artistic Director. The follow-up hit for All The Way has high expectations and we can’t wait to see this next dynamic chapter. In fact, Steve Vinovich returns to the role of President Lyndon Baines Johnson, after his acclaimed performance in ZACH’s All the Way. Despite division over the Vietnam War and ongoing civil rights issues, Johnson championed the most ambitious legislative work – an end to poverty and racial injustice, education for all schoolchildren, healthcare for seniors, and voting rights – in his vision of a Great Society. In this political thrill ride, The Great Society examines who we are, asks how we got here, and dreams of how great we could yet become. Joining Vinovich are CECIL WASHINGTON JR. as Martin Luther King; MEREDITH MCCALL (The Santaland Diaries, The Who’s Tommy) as Lady Bird Johnson; JEFF JEFFERS as Senator Bobby Kennedy; DAVID R. JARROTT (All the Way, Peter and the Starcatcher) as J. Edgar Hoover and Walter Cronkite; SHELBY DAVENPORT as Humphrey; JAMES DAVIES as Gov. George Wallace and Richard Nixon; MICHAEL MILLER (All the Way) as Senator Everett Dirksen and Cartha DeLoach; VINCENT HOOPER (Ragtime, A Christmas Carol) as Stokely Carmichael and Hosea Williams; ZELL MILLER, III as Bob Moses and James Bevel; MILES CHICK (All the Way) as Adam Walinsky and Robert McNamara; GARRY PETERS (All the Way) as Gen. Westmoreland; RICHARD ROMEO (All the Way) as Ralph Abernathy and Rep. Adam Clayton Powell; MICHELLE ALEXANDER (All the Way, Mary Poppins) as Sally Childress and Coretta King Scott; NASH FERGUSON as Jimmy Lee Jackson; and AMBER QUICK (All the Way, Mary Poppins) as Pat Nixon.